What Constitutes a Resilient Park? “Parks will save the world!” exclaimed Miami-Dade County Parks Commissioner Maria Nardi in her closing remarks at NRPA’s most recent Innovation Lab in Florida. This Innovation Lab focused on the role of parks in building climate resiliency, and with Miami-Dade County as the backdrop, the event brought to bear pressing challenges faced by park departments in at-risk communities. It also highlighted how one of the most vulnerable coastal areas in the world is maximizing the value of parks and open spaces for resilience. As predominant landowners within communities across the nation, park and recreation agencies are on the front lines of climate change and should be key players in developing resiliency strategies. We see examples of this in projects like The Estuary Commons in San Leandro Bay and Living Breakwaters in Staten Island, that involves natural infrastructure and the creation of new and needed public space. 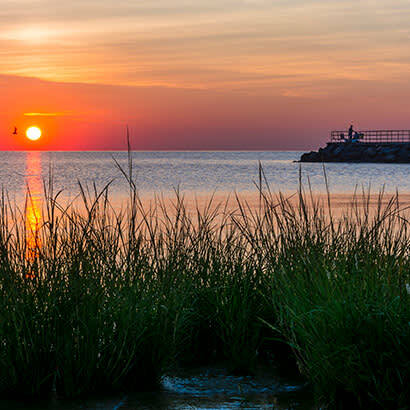 These projects integrate approaches such as living shorelines, establishing wetlands and new coastal habitat with the creation of greenways and recreational amenities designed to shift and transform during periods of extreme weather and flood. In large urban centers, where land is at a premium and public amenities are in high demand, this dual-purpose approach makes sense. It also helps address social resilience by creating neighborhood gathering places and opportunities for diverse community members to interact, prior to and after a disaster. Lower Manhattan’s Big U project, winner of Rebuild by Design’s Hurricane Sandy Design Competition, approached the resilient park concept with this dual-purpose method until recently when the project drastically changed form. Originally, the East River Park portion called for protecting the surrounding areas from storm surge and sea-level rise via a bridge berm at the back of the park. The new design would raise the entire park 8–10 feet, creating the park atop a berm and protecting the surrounding homes and buildings, the park and its amenities, and the critical programming and community use of the park in the aftermath of a disaster. For many in the park and recreation field, this change is understandable. Often millions of dollars are invested in these types of large-scale, high-profile resiliency projects. But, what is commonly left unaddressed is the need to increase the park departments’ capacity and budget accordingly to properly maintain and care for these spaces over the long term. While money seems to flow freely for capital improvements, funding for maintenance and operations is often less tangible and less appealing. For this reason, park professionals may prefer the “park-on-a-hill” approach over “repair and improve” following every big weather event. It’s important to note, however, that the updated design of the Big U East River Park project increased the price tag by $700 million. A missed opportunity? Perhaps. This conundrum does raise an interesting question which was brought up by Amy Chester, Rebuild by Design’s managing director, during this event. What exactly is a resilient park? What and whom are we trying to protect? Should we design parks to absorb the impacts of climate-related weather events and natural disaster, or should we focus on protecting the parks themselves? This question was not resolved during the Innovation Lab, but, it did spark some interesting conversation and thought among participants. Park and recreation agencies’ ability to act and prioritize climate resilience as part of their mission largely depends on the availability of resources; creative funding approaches to maintenance, operations and programming; and the willingness of leaders to prioritize and include parks in resilience conversations. Park agencies must be at the table as these decisions are being made, raising their concerns, collaborating on solutions and working across departments. There is a great opportunity for parks to “save the world,” but there are still some fundamental questions we need to answer first. This conversation is certainly far from over, and we would love to hear your thoughts on the subject. How do you define a resilient park? Join us on NRPA Connect during the month of April to share your thoughts. I look forward to hearing from you. Lori Robertson (she, her, hers) is NRPA’s Director of Conservation.